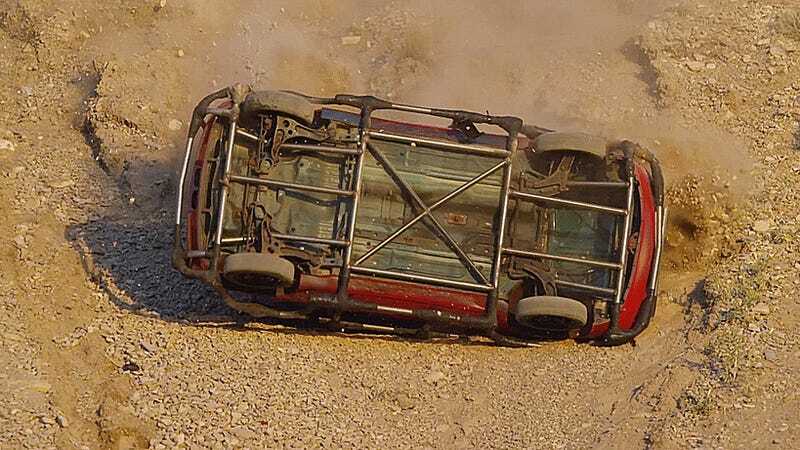 We just saw video of a car hurled off a cliff with a roll cage held together by duct tape. The results weren’t pretty. Then you see the same stunt again, using a cage made with a multipurpose repair material called “FiberFix” which the video’s advertising. It survives the fall! So is it real or what? The project’s technical engineer takes us through it. For a little more background, FiberFix is pretty much like a resin-reinforced repair tape that’s supposedly capable of withstanding liquid, extreme temperatures and heavy impacts. You probably got that if you watched the ad. FiberFix’s main claim is that it’s “100 times stronger than duct tape,” though back in 2013 inventor Spencer Quinn (a Brigham Young University student at the time) told Smithsonian Magazine it’s actually “significantly stronger,” holding 2,000 pounds in a load test that killed duct tape at 100 pounds. I guess it can also go higher? I don’t know about you, but I hadn’t heard about the stuff until this morning. Apparently I wasn’t the only one, hence the expensive commercial. Now that we have heard of it, I want to know if it really can coddle a car falling off a cliff. “We decided, well, I guess we just have to start testing,” said Harmon Brothers’ technical engineer Benton Crane. They wrapped all kinds of products and piping in FiberFix and subjected to a battery of endurance tests until they were satisfied enough to bring it to professional roll cage engineer Deveren Farley. He was skeptically willing to build the cage, presumably provided he was promised nobody’s life would depend on it, and once the shape was tack-welded together the joints were locked in with FiberFix for the crash. The yellow car (with the duct tape cage) and the red car (with FiberFix) both went off the same cliff at the same speed: 25 MPH. The moral of the story is “don’t make your roll cage out of any kind of tape” but holy crap, this tape is pretty strong. If you’re curious about how the stuff works in slightly more practical applications, FiberFix also has far less entertaining but more informative videos on their product in action too. Seems like a significantly better result than duct tape at a higher cost and slightly greater inconvenience. Then again, slightly greater inconvenience. Anyway “mystery solved” on the roll cage. Has anybody actually used this stuff?